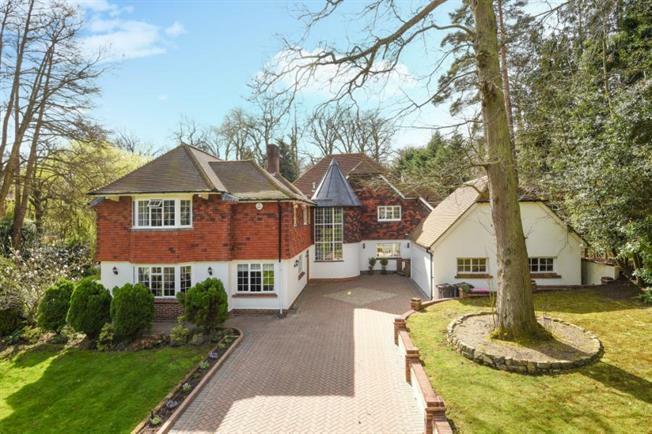 5 Bedroom Detached House For Sale in Keston for Asking Price £2,495,000. This property's price has dropped from £2,700,000 to Asking Price £2,495,000. Set in the heart of this exclusive gated private estate backing onto woodland and occupying a good sized gated plot we are pleased to offer Larchwood, a five bedroom period residence, well presented throughout with feature turreted elevations and indoor leisure pool complex. A combination of spacious bedroom and living accommodation all well-presented is complimented with fittings such as a bespoke Chambers of Knockholt kitchen/breakfast room, excellent recreation areas and views and access to secluded south aspect gardens backing onto woodland. The indoor pool room incorporates a Jacuzzi spa and steam room with separate games/gym area. Mature established gardens surround the property that occupies a quiet backwater of this highly sought after private estate. A gated driveway leads to a double garage. An early viewing is encouraged. Detached Double Garage With remote up and over door to front.